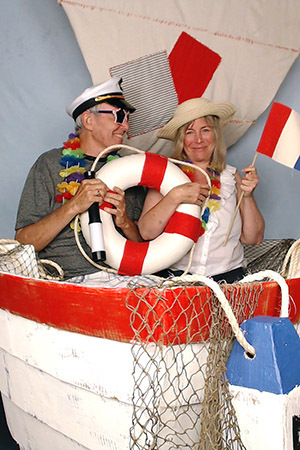 An Instant Photo Booth user was so excited about her recent success in creating a fun photo booth with our software and off-the-shelf components. Here is what she had to say. Just wanted to tell you that Instant Photo Booth was the hit of my mother’s party last night. 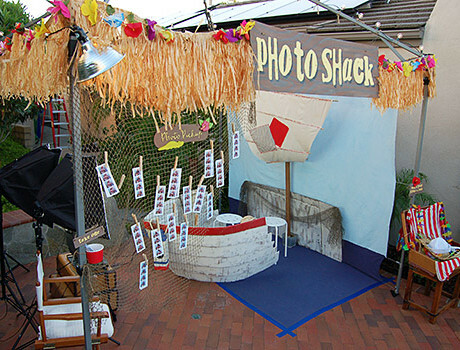 We had a “shipwreck” theme party, and bought the creative bundle to add extra styling to our photo booth. We built a cardboard boat and sail with a blue sky backdrop. We used my laptop computer and the Logitech C920 to take the photos. We purchased a $10 foot pedal so users could start their own session. The photo booth was outside, but we hooked up her family room TV using HDMI through a window to the computer so people inside could see what was going on in the booth. Everyone was so impressed. Many had no idea that software such as yours even existed. Anyway, I just wanted to thank you because the photo booth was a fun activity that people of all ages enjoyed. By the way, my mother was blown away by your software because she was quite skeptical about the idea of creating our own photo booth. Yes, you are more than welcome to put all or any of this on your Website. I wanted to make sure that you knew how much I appreciated your software. I have attached a few photos for you to see. I forgot to mention earlier that I uploaded the photo booth pictures to my one drive, then, on another computer, I downloaded them and printed them on 4″ by 6″ glossy photo paper. We used the configuration with two strips of four photos, side by side. After printing, I cut the paper in two, making two strips, and hung them with clothespins in a “photo pickup” area. 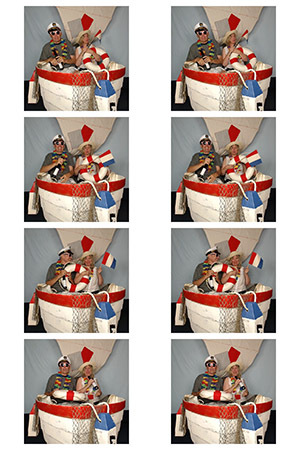 We also created a Facebook group for just the partygoers (or castaways, as we called them), and we’ve now uploaded all of the photo booth strips, along with the source photos, to the group for attendees to download and print their own. Love, love, love this application.